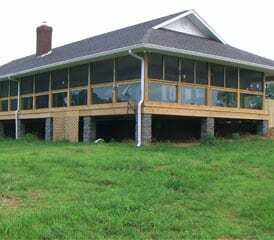 HARTSVILLE, TN — Contractor Steve Donnelly needed to screen a porch at his sister’s newly constructed one story house in Hartsville, TN near Nashville. The 1,920 square foot house sits on Old Hickory Lake and has a 1,128 square foot porch that extends the length of the home. The 94 by 12 foot porch sits 4 to 5 feet off the ground on one side and 3 to 4 feet on the other. Donnelly decided to install three by five feet of one-half inch laminated glass at the bottom of the porch and then screen another three by five foot area up to a railing one foot from the ceiling. Installing the glass, Donnelly reasoned, would protect the porch from the high wind that blows off the lake. He said the screened in area would enhance the beautiful view Old Hickory Lake without any obstructions. 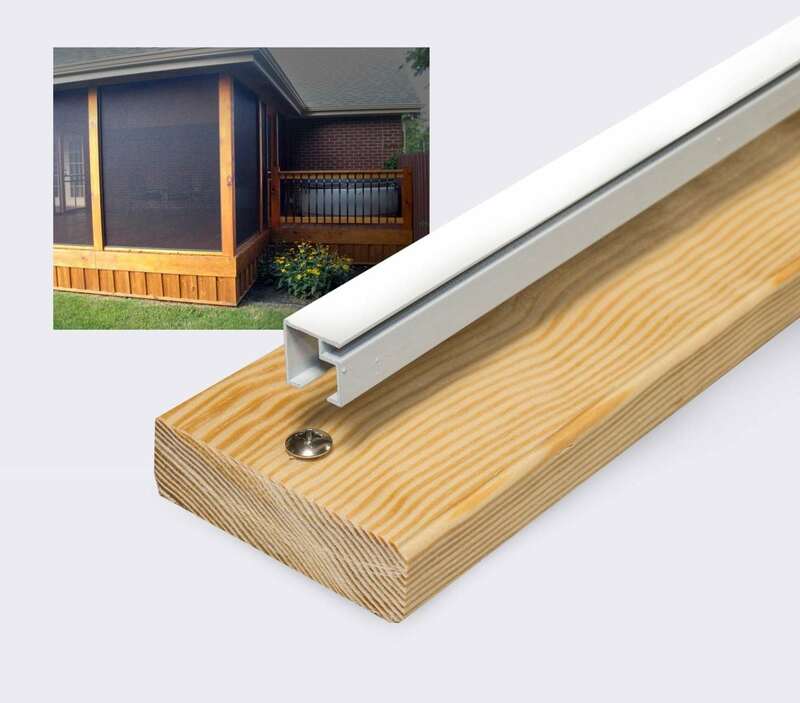 Just by chance Donnelly searched the Internet for porch screening systems and discovered the MINI Track™ two-part extruded porch system from Screen Tight™ based in Georgetown, S. C.
Donnelly confessed that the system really got him excited. He ordered the MINI Track™ system from his local home improvement store along with six Anderson™ 12 foot double slider doors, 40 12-foot posts, almost 800 square feet of gray nylon screen to cover the porch, six ceiling fans that he would place in front of each of the six doors, screws and grummets to complete the job and 1,500 square feet of a gray-colored outside carpet. Donnelly and a helper installed the glass paneling around the deck on the lower half of the porch and completed the framework for the screen by square cutting the 12-foot wood treated posts down to the size needed using a miter saw. Once the framing was complete, Donnelly had 25 openings that needed to be screened. The openings were 3-feet-tall and 5-feet-wide. Handrails were constructed using 2 by 8 foot pieces of board and installed throughout the porch to separate the glass paneling on the bottom and screen on the top. The leftover parts of the 12-foot posts were butted and joined together to create parts of the handrails and additional pieces of the frame. The frame needed to be covered and capped before the screen could be rolled on it. The MINI Track™ package includes ultra low profile clips that were screwed to the porch frame every 10-inches and 2-inches from the corners. The flat side of the clips was parallel with the frame. Donnelly selected mostly 8-foot bronze MINI Track™ channels but also needed three 10-foot length channels. After cutting the channels to length, Donnelly installed the left and right channel vertically by snapping over the clips and tapping them with a rubber mallet. Next, he installed the top and bottom of the MINI Track™ horizontals. The spline was then rolled into the groove of the MINI Track™ channels to hold the fabric in place. Donnelly started from the top and worked his way to the sides and bottom. At the end, he trimmed off any excess screen mesh. Repeating this process, Donnelly completed screening all the remaining sections. It took a day to fully enclose the porch from floor to ceiling. Tools needed for the project included a miter saw, roller knives, spline, screwdriver, drill and rubber mallet. Finally, six double slider doors were assembled which latch in the middle and cover the 12-foot opening. Ceiling fans were installed at each door location. Donnelly noted that the installation was very easy and that you never had to pull on a screen to get it tight because the screen tightened as he rolled the spline into the spline grooves of the Mini Track™ channels. “It was real unique and I am really glad that I found something like that,” Donnelly said after the installation. “With other screening systems, I would have had to go outside, stand on a ladder and install the screen from the outside. The porch was installed last January we have not had any problems. This entry was posted in Project Profiles and tagged Mini Track.